Many songs are written about the most important and profound issues we face… love, loss, the search for meaning, that sort of stuff. A song that touches people on that level is a special thing indeed. But far less ambitious songs can be special, too. 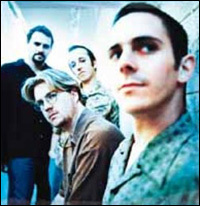 Toad the Wet Sprocket has released its share of both kinds of songs. In particular, Dulcinea (their best album) is a wonderful mix of depth and frivolity. On the one hand, the album is named after Don Quixote’s lover and features a song called ‘Windmills’ that explores that novel’s most famous metaphor. And on the other hand, we have today’s Song of the Day, a simple little ditty about a man who realizes that the handyman who just did some work on his house is his wife’s former lover. It doesn’t try to go anywhere with the situation — doesn’t turn into an exploration of jealousy, for example. It just lays it out there. I love the hum-along simplicity of the melody, Glen Phillips’ lead vocal and the band’s backing vocals, the interplay of bass, drums and electric guitar in the bridge. All of that. But mostly I love the matter-of-fact retelling of a scene you just know happened in real life. This entry was posted in song of the day and tagged Dulcinea, Stupid, Toad the Wet Sprocket. Did you read something about this song? I guess “she says she knew him once” is supposed to launch us into thinking there was some great love affair between the Mrs. and Mr. Carpenter? I like the song well enough, but I’d like a bit more to play off than that final line. I think “she says she knew him once” gives you pretty much all you need, especially when couple with the chorus (though I did read something confirming the song’s meaning while prepping this blog entry). It’s that sort of offhand confession that shoots right into the heart of the typical man and sends his mind flying to the worst possible places. For some reason, I always confuse Toad and the Wet Sprockets with the Red Hot Chili Peppers and I attribute Chili Peppers songs to Toad. This does not bode so well for Toad as I am not a huge fan of Chili Peppers. So when I hear a song like this one, I am reminded that I really do like much of Toad’s work. This song has popped up randomly on my IPod a few times over the past few years, and I always find it imminently listenable.